A few weeks ago I did a second photoshoot with Blue & Cream this time focused on fall looks. I’m obsessed with all of the outfits I wore and can’t wait to share them over the week. This first look is a go to pick incorporating seasonal colors such as beige, dark blue, and red. I love how the color scheme still has a pop of color, but the main focus of the outfit is obviously on the graphic sweater. The IRO jeans are the perfect transitional piece to take you from fall to winter with the addition of layers while the Markus Lupfer sweater adds some chic drama whether grabbing lunch with a friend, doing errands, or taking a moment to admire the changing leaves. 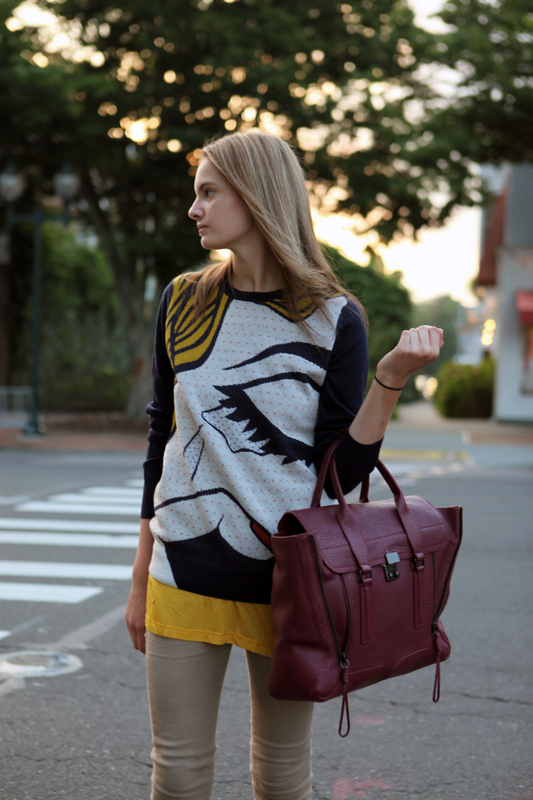 The 3.1 Phillip Lim Satchel is this seasons hottest bag, and the gorgeous red color practically screams hello fall! It’s a carry all that won’t weigh you down and adds a touch of uptown glamour to any look. Add a boot to complete the look, like this one from Isabel Marant, and you’ll be on your way. Check back tomorrow for look number two, xo.